The publication is about a newly developed method to monitor and optimize belt conveyors, based on a high precision reproduction of the conveyor behaviour using a digital twin. By this numerical reproduction and the continuously performed synchronization between calculation and measuring, the system achieves an unmatched transparency of the belt conveyor’s actual condition. Besides precise information about the overall efficiency, the system delivers early warnings about any changings of the physical state of the conveyor. The generated data allows analysis about time, place and root cause of the changes as well as quantitative statements about the operational properties of the main components in terms of energy efficiency and achievable lifetime. This enables a significant reduction of cost and downtime on the monitored conveyors. In the long run, this approach has the potential to speed up the improvement of the main components. The presentation is interesting for operators, maintenance managers and suppliers of whole belt conveyors or single components. Billions of tons of conveying material produced worldwide in the raw materials extractive industry and processing are bulk materials such as coal, cement, limestone, ores, rocks, gravel or sands. The variety of transported goods, including plastic granules, such as raw materials for injection casting processes, as well as agricultural products such as maize, rice, beets or potatoes, or pharmaceutical products such as tablets, as well as fine powders, such as those in laser- or 3D-printers use are marking the vast variety. However, conveyor belt logistics have long been classified as not very significant for value creation and for this reason rather neglected. It was only during the last 40 years that the importance became more and more widely known. 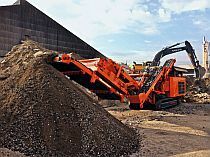 For many years, belt conveyors have been a robust and reliable equipment for the economic transport of large quantities of bulk material, as they are produced in particular in mining. Conveyors with lengths of a few dozen meters to more than 20 km and transport capacities from a few hundred to 40 000 t/h are state of the art today. Reliable design is no longer a problem thanks to standardized and internationally agreed calculation methods. However, on closer inspection, it can be seen that there are large differences in the availability of different systems and virtually no operator is able to calculate their actual specific transport costs per tonne of material per km of transport distance. 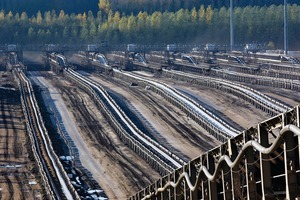 The reasons for this are, that each conveyor system is unique and therefore difficult to compare with others and that there is still no recognized procedure to determine the necessary maintenance measures correctly and at the right time. Here is an enormous potential for optimization, resulting in the development of the system described below. discussed a measuring rig and the horizontal moving resistances FH measured on different conveyor belts during operation as a function of the vertical load FV (Fig. 2). If one applies equation (1) to an installation section of the slope d = 0 and the length of a support roller spacing of this measuring stand, the theoretical main resistances shown in Figure 3 are obtained for different virtual friction factors f compared to the actual main resistance measured for a particular belt (dashed line) and the main resistance calculated with the analytical calculation model described below (red solid line). The specification of the f-value for a belt conveyor is thus only meaningful in connection with the mass flow for which this f-value applies. 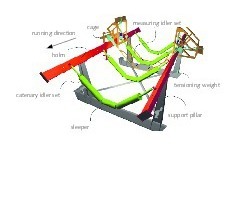 Even then, the evaluation of the efficiency of this belt conveyor on the basis of the f-value is highly questionable, since the mass of the belt and the idlers (m’G,i and m’R,i) are included in the calculation, although only the energetic expenditure to transport the material is of interest. In fact, the running resistance of the idlers is almost independent of the translational mass of the idlers, but is largely determined by the bearing size, the bearing clearance, the seal and the bearing and sealing grease used. Support rollers with very large translational mass, but otherwise the same design would thus lead to a same main resistance, but a mathematically lower f-value. In summary the f-value is not meaningful for the assessment of the energetic efficiency of a belt conveyor and thus is not suitable for continuous monitoring. In terms of design, the moving resistance is influenced by the choice of the troughing angle, the length of the centre roller, roller spacing and diameter, belt width, belt weight and speed. These parameters are usually all known and usually constant over the life of the plant. In rare cases, the speed is adapted to the current load. The operational influences come from the conveying process and relate to the height and temporary change of the load, lump size and distribution, specific density and internal damping of the material. These values ​​can vary and are in part unknown. The maintenance condition also has an influence on the moving resistance. 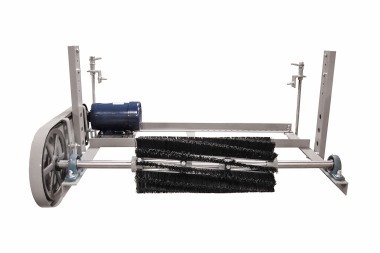 Misaligned idler rigs, lack of cleaning, incorrectly adjusted scrapers and longitudinal seals not only lead to higher energy consumption, but also to misalignment and belt damage and generally to a shorter service life of belt, idlers and pulleys. Worth mentioning is also the influence of the main components “belt” and “idlers”. In particular, the belt has a large influence (essentially thickness and characteristics of the running plate), which also changes with temperature and aging state. The selection of these components takes place initially for the construction of the system by the original equipment manufacturer (OEM) – often according to the specifications made by the operator. In the replacement procurement often other makes are used, which can change the power requirements. Frequent phenomenon: an old belt with thin cover plates is replaced by a new one resulting in restrictions on the flow rate, as the installed engine power is no longer sufficient. A closer look at this issue can be found in VDI Guideline 4459, from which table 1 is taken. It is initially assumed that the properties of the components “conveyor belt” and “idlers” involved in the main resistance as well as the alignment state of the system are the same at all points. With optimum adaptation of the analytical model to the real belt conveyor and ideal homogeneity, the calculation of the belt force around the whole belt results in no deviation between the start and end value of the belt force. However, since the real system is not homogeneous, deviations arise which can be converted to a difference between the calculated and the measured motor power - even with ideal adaptation. The geometric mean of this difference over a sufficiently long period of time is a measure of the quality of the model and can be used to adapt the parameters of the analytical model via a suitable optimization algorithm. In reality, average deviations of well below 1 % of the installed drive power are achieved (Fig. 4). The deviations themselves – in Figure 4 the green time curve – represent the inhomogeneity and thus also the optimization potential. From them, the information about the efficiency of each conveyor section and – if the passing of the belt splices is measured – of the individual belt pieces, from which the entire belt is composed can be obtained. The analytical model is based on a mathematical-physical replication of the real conveyor. 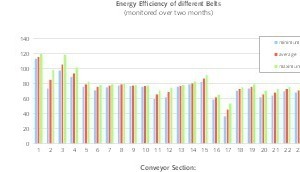 This also includes the temperature dependence of the belt properties and the heating and cooling behaviour of the belt. The exact adaptation of the analytical model is made by skilful selection of the parameters of the functions, which describe the moving resistance as a function of the operating parameters “local load, speed, belt tension and temperature”. Together with the data record that describes the structure of the conveyor, this condition parameter record maps the conveyor. Thus, the system can not only be simulated in the current operating state, but also in all possible operating conditions and for all ambient temperatures. As long as nothing changes in the physics of the system, this condition parameter set is valid and provides reliable results. Thus, in particular for a standardized operating state with a selected, uniform load and constant ambient temperature, a characteristic number can be formed which represents the specific energy requirement for transporting one ton of material over a horizontal transport distance of one km. This “standardized Energy Performance Indicator” EnPI has the unit Wh/(t km) and allows the evaluation of the energy efficiency of a conveyor system over time, or in comparison to other systems. If something changes in the physics of the conveyor (alignment state, degree of soiling, properties of the belts and idlers) or the quality of the measurement data (incorrect data acquisition), this is detected as a permanent exceeding of the specified tolerance value and an automatic search for a new condition parameter set that meets the accuracy requirements is triggered. This is followed by a message to the responsible plant supervisor. The EnPI is an index that provides a macroscopic overview of the condition of the conveyor system, acting as an early-warning system in the event of any deviation. With the current condition parameter set to which this EnPI applies, it is possible to make precise forecasts of the power requirements that will arise when another operating condition (load, speed, ambient temperature) occurs. With this it is possible, for example, to assess whether an increased production rate can be achieved with the installed motor power. The simulation of the temperature behavior also predicts the development of the power requirement for the start-up of a conveyor system which has been standing for a relatively long time and therefore has adopted the ambient temperature. Thus, it is also possible to predict how the power requirement for restarting will develop with increasing downtime when the conveyor is shut down in cold weather. The conveyor sections with the lowest energy consumption can be used as a reference for which improvement potential is at least achievable through a general improvement of the conveyor state. This not only reduces the energy consumption, but also increases the maximum possible transport capacity with the currently installed motor power. If the belt conveyor is equipped with a belt splice detection, the system can also determine the efficiencies of each belt. 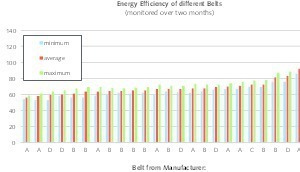 This gives the opportunity to prefer belts for replacement that have proven to be more energy-efficient, or to make concrete specifications to manufacturers in this regard. 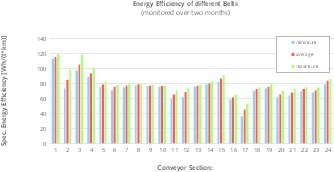 For a specific application, the investment and belt efficiencies shown in Figure 4 were determined over a period of five months. 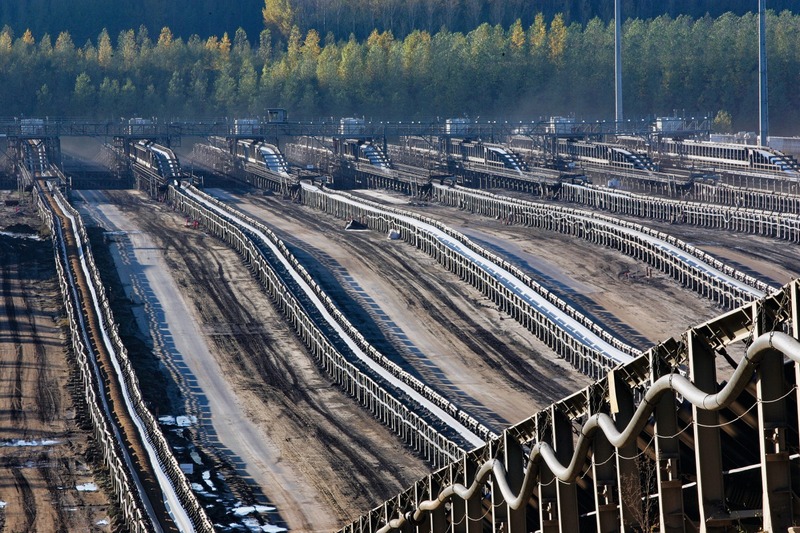 Since this comes from a shiftable conveyor in an open pit mine, the range of conveyor section efficiencies is wide and significantly greater than what can be expected for stationary installations. 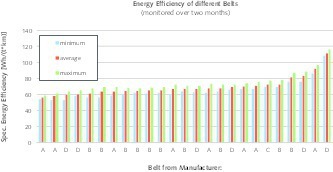 The belt efficiencies between different manufacturers and belts of the same manufacturer from different batches differ considerably. 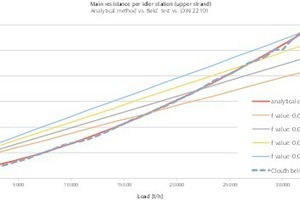 This is consistent with previous studies by , where the running resistance of the belts was determined directly with the measuring rig described by . The system allows the continuous display of the maximum delivery rate at which the overload condition occurs under the current conditions. This can be either the exceeding the installed power of the motor with the highest load, or the slip limit of the most critical drive pulley determined from the belt pretension, the wrapping angle, and the current friction value. Since all measurement data and relevant calculated values ​​are stored in a database, the operating stresses can be determined for each point of the installation, each belt and each component for any period of observation. If a defective component has to be replaced, then the achieved load spectrum can be determined and used for comparison with other components. This makes the overall profitability transparent for an optimal selection in replacement procurement. 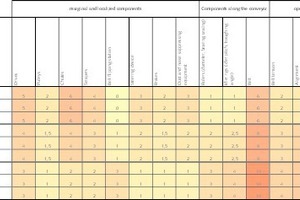 If sufficient data is available, the substance of the currently installed components can be determined with respect to the statistically achievable load spectrum and it can be estimated from this, how many components have to be changed by a given time in the future. Thus, the maintenance effort can be planned easily and precisely. The possibilities offered by this approach cannot yet all be estimated. In any case, it will be feasible to model the behavior of the components in sections and quantitatively correctly from the inhomogeneities. This could be used to determine the running resistance of each belt as a function of load for each temperature, speed and aging condition. This will greatly boost the optimization of the components. 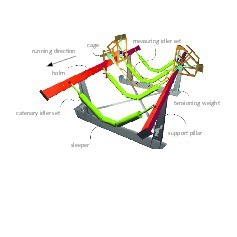 As experience grows, the analytical model can be further improved, allowing the useful division of the conveyor into individual sections with higher granularity (currently, the sensible section length is about 50 m / section). This allows a correspondingly more accurate localization of deviations. The analysis of the specific causes of deviations can be used to identify typical signal patterns for these deviations and to implement an automatic plain text message for future occurrences of this kind. In summary, the concept of the “digital twin” opens up unprecedented transparency for the operation and maintenance of conveyor systems. The basis for this is the correct description of the technical mechanics, the permanent recording of the most important operating parameters and the constant adjustment for the automatic adaptation of the model to reality. The evaluation capabilities developed on this basis can be continually improved and used to automatically generate accurate notifications of relevant changes to the persons responsible. 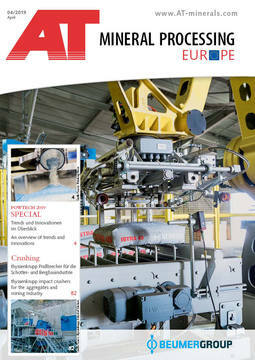 The exclusive expertise of a few experts becomes accessible to every belt conveyor operator using this system. Shaping of the upcoming changes are called for and not just try to manage them. Innovation cycles are getting shorter. 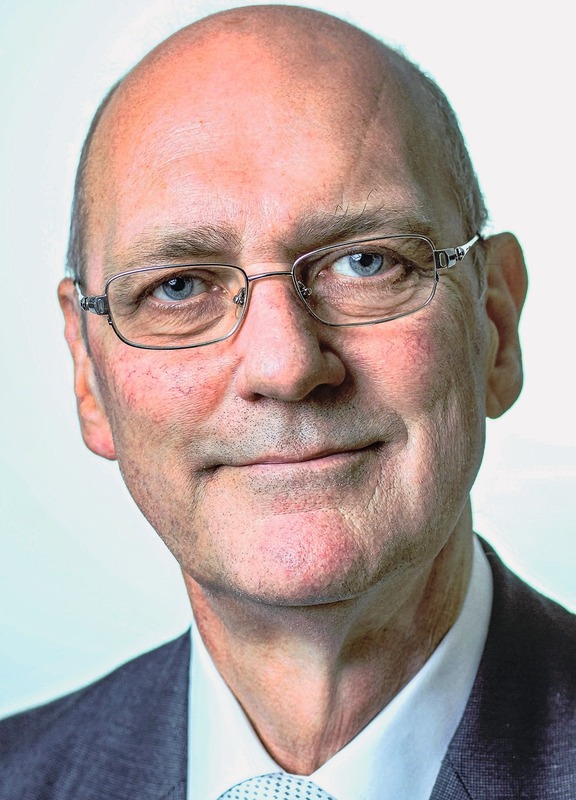 Digital technologies are increasingly determining developments in the raw materials sectors. We meet the term digitization all over the world-in all industries and areas. In result, likely there might be left only two types of organisations in the future: Those that work on the basis of digital technology and those whose economically independent existence will be increasingly threatened by digitally positioned competitors. A term that now often appears in this context: Is “disruptive.” Disruptive technologies are called innovations that replace or completely displace the success of an existing technology, product or service. The development has a profound impact on traditional business models, from apps to intelligent use of data. 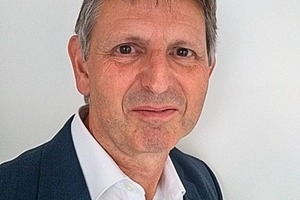 So-called start-ups and powerful concerns with resources, strategy and expert departments, created in the wake of the digital revolution, are agile and break with old habits. 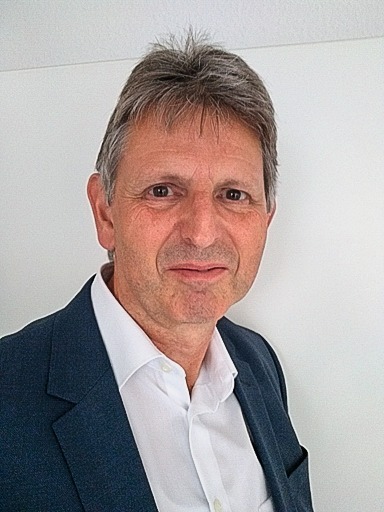 Their goal: To radically change the existing industry, offer new products, reach and support customers more easily, reduce costs and expand rapidly. All this may be based on the use of centralized, cloud based digital technologies and applications from areas such as occupational health and safety, environmental protection, automation of mining processes with analytics, data security. 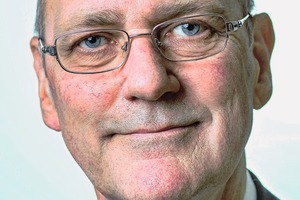 The increasing importance of the Internet of Things (IoT) in mining means that everyday things suddenly become digital: From working time recording and site detection, to the supply of additives such as electrical energy, compressed air, biologically dissolvable HFC fluid and water, vehicles, control devices and modules to tackle energy efficiency, etc. Used in the right way digitization will be a true advantage in day to day operations along complete value chains.